Mix bread crumbs, cheese, oregano, garlic powder and pepper in a large flat dish or on a plate with a lip. Brush mustard on all sides of the chicken. 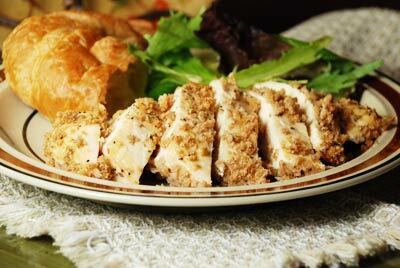 Coat both sides of chicken with bread crumb mixture and place on a large baking sheet or casserole sprayed with nonstick cooking oil or lined with parchment paper. Bake at 375 degrees F. uncovered, for 25 minutes or until juice is no longer pink when centers of thickest part of chicken is cut.